The interdisciplinary research group is engaged in the laser based Additive Manufacturing of metal parts. The group deals with fundamental as well as industry specific application research projects in order to assure a comprehensive understanding. Research in the group focuses on two processes, namely Laser Beam Melting in powder bed (LBM) and Laser Metal Deposition (LMD). Both are based on the principle of creating fully dense structures by melting metal powder layer by layer with a focused laser beam. However, in the case of LBM the powder is provided by a wiper whereas in the case of LMD it is injected by a powder nozzle. The LBM and LMD processes are unique with abilities such as fabrication of complex geometries (e. g. undercuts) and multi-material fabrication respectively. 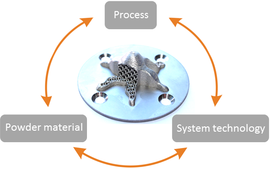 Research at the group is integrated between process understanding, powder material and system technology (see figure). Along a completely implemented process chain (including powder analysis, data preparation and post-processing) in its own manufacturing laboratory, the research group deals with qualification and process parameter development of new metal based materials for laser based Additive Manufacturing processes. In order to realize the full capability of research, system technology development and modification is performed according to the requirements. Within the fundamental research activities of LBM and LMD, physical understanding of the interaction between the powder material and the system technology is established to achieve the full potential of the technology. Based on the acquired fundamental knowledge, research is performed by the group to ensure development of industrial applications. At the same time, the intensive exchange with the industrial partners helps at defining goals of long-term relevance for fundamental research activities. The research group is a member of the Joint Institute of Advanced Materials and Processes (ZMP). Above all, the group has access to the broad expertise in laser material processing which comes with its location at the Institute of Photonic Technologies. Contact person is Florian Huber, M.Sc.